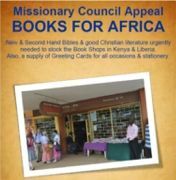 New & Second Hand Bibles & good Christian literature urgently needed to stock the Book Shops in Kenya & Liberia. Also, a supply of Greeting Cards for all occasions & stationery. 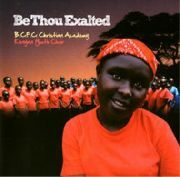 Both of the CD's of the BCFC Christian Academy Choir, Kenya, have been uploaded unto the internet (iTunes, Amazon MP3, Google Play, Spotify, Emusic, Media Net, and Rhapsody). The two titles to search for are: 'SPREAD THE NEWS' and 'BE THOU EXALTED' Please visit the sites and download a tune or album. All revenue goes to the school. The March Edition of Missionary Vision is available in the gallery section. This edition includes a General Mission Board update and articles on the Gardiner family in Ausrtralia and the Alvarez family in Spain. The video recording of the Special Missionary Rally to focus on the works in Nepal and Kenya, is now available in the gallery section. Noreen McAfee gives an update on the work at the BCFC Christian Academy. I have returned to Liberia after a three week trip to Northern Ireland to meet, get to know, and bring back a German Shepherd named Reilly as a guard dog for our compound. Reilly has been settling in well: he seems to have adjusted to the heat, and his favourite occupation when outside is chasing lizards. All the workers and guards are terrified by him! The weeks have been busier than ever since I returned! The wife of one of our pastors died suddenly at the end of January so we travelled to Rivercess (4hours drive away) for the funeral. We enjoyed a visit by two of our North American Mission Board members to hold a workshop for pastors here from February 13-19. At the minute we are very concerned for a Sunday School child, a boy of 13 who seems to be entering the end stages of a chronic illness. We are trying to take steps so that I can oversee his care on a daily basis. In the midst of these situations, I am endeavouring to keep up the regular schedule of children’s meetings, reading, and music, and to encourage the kids to come back (the attendance always drops when I’ve been away for a while).